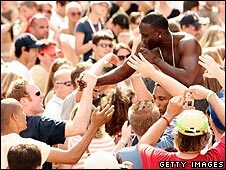 BBC NEWS | Entertainment | Akon: Pop star or businessman? 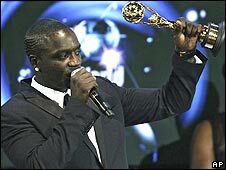 Akon: Pop star or businessman? He has sold more than five million albums, shifted four million ring tones, part-owns a diamond trading company, and had ceasefires called in his honour in Africa. His name is Akon - or Aliaune Dmala Bouga Time Puru Nacka Lu Lu Lu Badara Akon Thiam to his parents. He is in the UK to promote his third album, Freedom. It is one of the most-anticipated R&B releases of the year, but the record was not without its teething troubles. "Too many songs have gotten leaked," the star complains - blaming a hacker who intercepted songs as he sent them to his engineer from his laptop. This caused something of a headache for the 34-year-old star, who scrapped every song that found its way onto the web and started afresh. "Once it's on the internet, everyone gets it," he explains. "They download it and keep it on repeat at home or when they're cleaning. So the album is already exposed. You want people to buy it not knowing what to expect." The final, hack-proof album, out this week, has been trailed by the single, Right Now (Na Na Na), which is already in the UK top 20. Like many US R&B stars this year, Akon seems to have belatedly discovered European dance music - incorporating staccato synth lines and uptempo drum loops into his soulful tale of heartbreak. "It all starts with the artist that actually travels," he says. "Me, Ne-Yo, Chris Brown, Rihanna - we all spend a lot of time in places like the UK, France, Italy and Germany. Places where they actually play this type of music. And we see the effect that it gives to people in the club. "So naturally, you want your fans to be able to experience that." 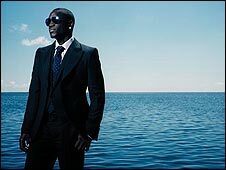 Furthermore, after establishing himself as a soul crooner with hip-hop credibility, Akon wanted to expand his self-titled "Konvict" sound. "We wanted to refurbish and do a whole make-over," he says. "From the sound of it, all the way down to how people perceived it." If he sounds more like a marketing department than a musician here, don't be surprised - Akon spends a lot of time talking about business and his "brand". Asked about his recent high-profile collaborations with the likes of Eminem, Michael Jackson and Gwen Stefani, he isn't interested in discussing their skills in the studio. Instead, Akon waxes lyrical about "how they perceive the business, how they move, how they became successful". On his penchant for writing break-up ballads, he deadpans: "I noticed that those kind of songs really capture the audience because a lot of people are going through that." Cannily, he sings the name of his record label, also called Konvict, over the intro to the majority of his songs (even ones he has produced for other artists) making sure that you know who you're listening to, even if you've just stumbled across one of his songs on the radio. But the vocal motif is more than just a branding exercise. 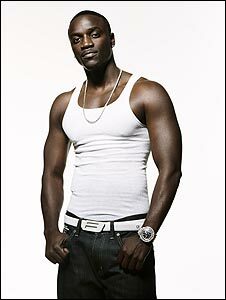 Pre-fame, Akon became involved in a car theft ring and, by his account, spent three years in jail. "The convict thing is a reminder more than anything," he says. "I'm reminding myself of those times and those experiences. Just like, 'phew, I don't ever want to go back there again', do you know what I mean?" Which is all very well - but earlier this year, The Smoking Gun website published an investigation into Akon's criminal record, which claimed he had spent only a few months in jail, and that a charge of possessing a stolen BMW was later dropped. "I wish that Smoking Gun article was true," he says in London. "But I used that situation [jail] to better my life and help other people in the same position - they can use me as an example and say, 'it's not over because you have a criminal history.'" Certainly, his official biography reads like Akon has realised the American dream - raised in Senegal, taken to New Jersey when he was seven, jailed in his 20s, and a multi-platinum artist in his 30s. He hasn't forgotten those African roots - remaining fluent in Wolof, playing the djembe on his new album's title track, and touring the entire continent last year. "I'm African, so I'm not afraid to go to a lot of places where most people are afraid to go to," he says. "A lot of places, they'll have a ceasefire while we're there. "And as long as they've got a microphone set up with a stage and speakers, I'll perform." The singer is also keen to take his new album around America's penitentiaries, Johnny Cash-style. "I would love to do something like that, and make a real live, acoustic record that really focuses on me - my voice, my tone. "No effects, no nothing. Just straight out." Akon's third album, Freedom, is out now on Island Records.